Grandad is very old – he can remember the Angel of the North before it was surrounded by the large oak trees. He reflects on the many changes since his youth, in a very human and haunting take on change. Originally in Asimovs, July 1999. Kim Stanley Robinson. Sexual Dimorphism. Originally in Asimovs, June 1999. On Mars Dr. Andrew Smith’s studies lead to a moving apart with his partner. Swimming gives him an outlet, and the dolphins a way out. Robert Reed. Game of the Century. Originally in Fantasy & Science Fiction. Somewhat clunking story of an NFL where the top players are bio-engineered chimeras. Perhaps a missed opportunity for a more subtle treatment of issues which drug-taking in sport, and issues of race in professional sport, have already hit the headlines. Michael Bishop. Secrets of the Alien Reliquary. Sarah Zettel. Kinds of Strangers. The first flight to the asteroid belt has a major disaster and there appears to be no hope of rescue. The strain tells on the crew, who suffer depression, and for some suicide is the only way out. But a solution appears. 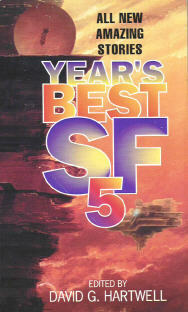 Hard SF mixed with good characterisation – not something that happens all too often. Cory Doctorow. Visit the sins. Many of the older generation have chosen a surgical option which enables them to drop into maintenance mode for large chunks of the time. Far future humanity, with immortality the rule. Amongst those who know of no other way, there is one with a link back to the days of pre-immortality. Online here. Originally in Fantasy & Science Fiction, Oct/Nov 1999. Near future solution to helping those relatives of the victims of the Oklahoma bombing achieve closure. Chris Lawson. Written in Blood. The Qur’an has been encoded in such a way that is can be injected into the bloodstream of Muslims. Gene Wolfe. Has Anybody Seen Junie Moon? Intellectually challenged weightlifter meets Junie Moon, and they follow the clues given to her by a native American, in an attempt to find the White Cow Moon. Robert J. Sawyer. The Blue Planet. Shows why are we having such a bad run of luck in landing craft on the red planet. Kyoko is having relationship therapy, not altogether happy with her partner, chosen by the system. Originally in Artemis, Spring 2000. The dark side of the moon throws up a deserted alien settlement. One of the few potential clues lies in their collection of literature from the planet earth. Perhaps their classification system holds an answer to their psychology and view of things. Sounds like a job for …. a librarian! Brian Aldiss. An Apollo Asteroid. Joyce Bagreist’s discovery of computing based upon the colour spectrum, prompted by an understanding of the true nature of the Northern Lights, leads to an understanding that our maths is a purely local construct. An asteroid impact on Moon further shows the extent to which we are but a very small part of a much much larger totality. G. David Nordley. Democritus’ Violin. A nano-replication of an old violin poses some searching questions, and an opportunity to puncture an academic windbag. Set aboard a space ark, genetic enhancements, a variety of social structures, statistical profiling etc. SETI has been successful in identifying and decoding messages from the stars. But on Earth a hedonistic lifestyle, social stratification and other problems get in the way of any true engagement with the philosophical constructs from the stars. Originally in Fantasy and Science Fiction. Far far future Earth in which one way of surviving an Ice Age brought on following a major meteor impact has been for humanity to follow the example of penguins. Brian M. Stableford. Ashes and Tombstones. Post-crash, in which the space program is to be relaunched. Will true immortality beckon for robots? And if so, what will be the nature of those robots? Some understanding of Manga comics, and model-kits will undoubtedly help. Yasuko Miyata finds the process of putting together a model with a true AI and emotions installed on microchips mirrors her real life. Originally in Science Fiction Age, May 1999. Alternate History as an art form. Lucy Sussex. The Queen of Erewhon. Originally in Fantasy & Science Fiction, September 1999. Post New Zealand matriarchical polyandry in the style of Le Guin (down to the occassional explicit sexual reference). Quite a good range of stories, but interestingly, having put this page together at the same time as the Year’s Best SF #4, which was an excellent collection, the stories above don’t seem to quite amount to a similarly high standard.